Ultrasound images may be recorded by our specifically trained technician for review by a board-certified veterinary radiologist. In certain cases we may directly involve a board-certified radiologist who can offer their mobile services at most SVA locations. They provide more involved and specialized examinations plus expert biopsy services on an as-needed basis. 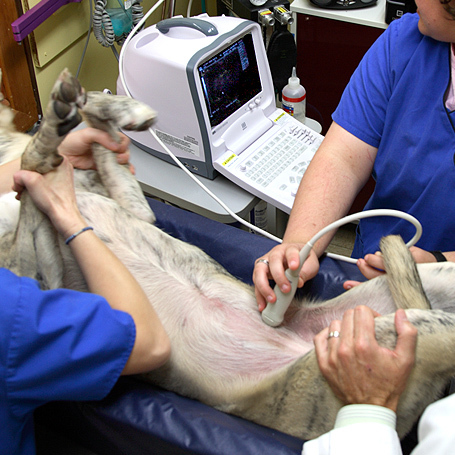 Ultrasound-guided biopsies provide a precise and less-invasive means of obtaining deep-tissue samples for evaluation by a veterinary laboratory. In addition, SVA has partnered with a board certified cardiologist, Dr. Jerry Woodfield, to provide on-site cardiac consultations and echocardiograms (ultrasound examination of the heart) at the Queen Anne facility.